Hi folks and welcome to the first GFI News Letter of 2013. And now they are into Northern Irelandwith their GF Bread available in branches of Dunnes Stores from the 29th January 2013. Find Bfree at www.bfreefoods.comLazy Day Foods Dermot Farrell from Raphoe in Co Donegal is now representing Lazy Day Foods in Ireland and we recently sampled some of their products including Cookies and the excellent Lazy Day Millionaire’s Shortbread. They are Gluten Free, Wheat Free, Dairy Free, Egg Free and suitable for Coeliacs and Vegans so give them a try when you see them in the shops! Recently, we have had the pleasure of sampling some products from The Cake and Crumb bakery in Emyvale, Co Monaghan. We had Apple Tart, Carrot Cake Cupcakes and Rocky Roads and they were all a real treat. Tina said they were just like “home made” only better! Even the non Coeliacs in the family were impressed – they couldn’t tell that they were Gluten Free! Look for The Cake and Crumb name when you are out and about and buy yourself a treat! The latest edition of Flavour Magazine has arrived with us and, as usual, it’s jam packed with all kinds of foodie goodies! 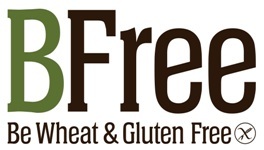 If you have come across a new Gluten Free product that you believe would be of interest please tell us about it and share the experience.oods – don’t miss it as FreeFrom covers Gluten Free foods! st like “home made” only better! Even the non Coeliacs in the family were impressed – they couldn’t tell that they were Gluten Free! 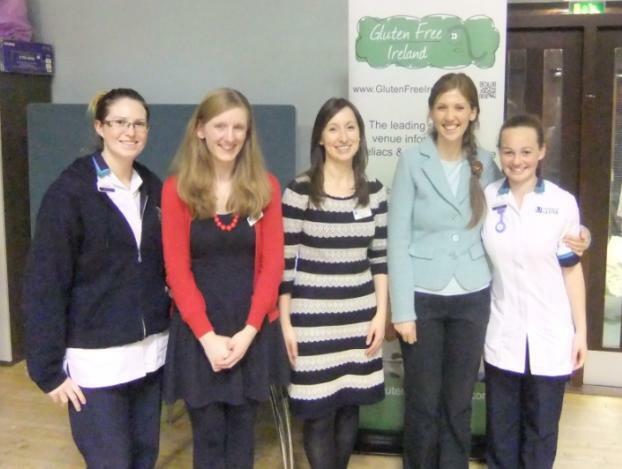 Last November Noelle Power, a Nutritionist with the South Eastern Health and Social Care Trust, held a series of three Coeliac Information evenings with the first two in the Ulster Hospital, Belfast and the final one in Lagan Valley Hospital, Lisburn. The evenings were very well attended with between 80 and 100 people arriving at each event, a reflection of the interest folk have in learning more about the Coeliac condition and how they can help themselves cope with it on a day to day basis. Each evening commenced with a cup of tea or coffee and gluten free goodies supplied by companies such as Glutafin, BFree Foods, Juvela and Kelkin. The real business of the night then got under way with a talk by a Doctor specialising in Gastroenterology in which we learnt about the history of Coeliac Disease, the cause and effects it has on the body and what research is being done to try and improve the outlook for patients. 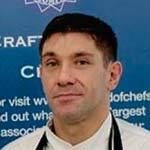 This was followed by a Gluten Free Cookery demonstration by Michael McCamley – Coeliac UK’s Gluten Free Chef of the Year in 2010 and 2011! The audience then had the chance to stretch their legs with a short interval to allow people to visit the various stands around the hall, including the Gluten Free Ireland stand. The event concluded with Noelle giving a very interesting and informative talk entitled “Healthy Eating and the Gluten Free Diet”. Topics covered included the critical job of Reading Labels, Healthy Eating, Ingredients that are not Gluten Free, Storing and Preparing Food, Labelling Legislation, Travelling Safely within Ireland and travelling abroad using Airports and Airlines. All in all a very useful exercise by the Hospital with special thanks going to the “boss” Noelle and her willing assistant Danielle not forgetting the other Dietitians and Student Dietitians from the hospitals who helped to make the evenings such a success. Some of the ladies from South Eastern Health & Social Care Trust who made the Coeliac evenings happen – from the left, Kate Murphy (Student Dietitian), Fiona Armstrong (Dietitian), Noelle Power (Dietitian and Team Leader), Danielle Kinnear (Dietitian), Marianne McGovern (Student Dietitian). However, the trouble has caused serious damage to specific businesses on some roads including Mr JD’s New Titanic Restaurant at 222, Newtownards Road Belfast. Emergency Food Supplies – are you prepared? No doubt many of you reading this article will be familiar with the terrible floods people in England and Wales experienced last year and the more recent snowfalls across the British Isles. I know there has been localised flooding in parts of Northern and Southern Ireland in the past but not, I believe, on the same scale as we have seen in GB. Watching the television pictures of the snow and floods and the ensuing rescue efforts made me wonder how Coeliacs would cope if caught up in such an emergency? In one village the flood water rose to a depth of 4 Feet in 30 minutes giving folk little time to rescue anything never mind trying to put together an emergency pack of GF food! In the USA there are companies who specialise in providing emergency food packs (including Gluten Free food with a long shelf life). Is that something Coeliacs who live in areas under threat from flooding etc should be thinking about before the next natural catastrophe overtakes us? Our Facebook page is now very popular and, to date, we have 929 “Likes” which is tremendous and leaves us heading for our first thousand! While we are getting a reasonable level of interaction on our page we would love to see more folk use it to tell everyone about their favourite GF watering holes, support groups, or whatever Coeliac related experience you have had! Let’s be hearing from you! The NITB has added us into their Discover Northern Ireland web site –www.discovernorthernireland.com/food as they recognise the demand from visitors for Gluten Free food and the need for Tourist Information Centres to give suitable advice. Marble Arch Cave Restaurant (Camlake Catering) at Florencecourt, Co Fermanagh. The restaurant is open from March through to September and they are very Coeliac Friendly! More details on our website.